Gone are the days when Ramazan meant hardly any television. There was a time when there was only PTV that even drama serials did not air during the holy month of Ramazan and everything on television either covered only news shows or something which was directly related to the month of Ramazan. This was done because even the television authorities wanted to reinforce the belief that this month should be dedicated to prayers and recitation of Quran. There is a recent trend now of hosting special Ramazan transmissions which are not entirely depicting the true spirit of the month. This trend is being followed by more and more channels with every passing year. These Ramazan transmissions are a mixture of entertainment shows with some talk about Ramazan here and there. 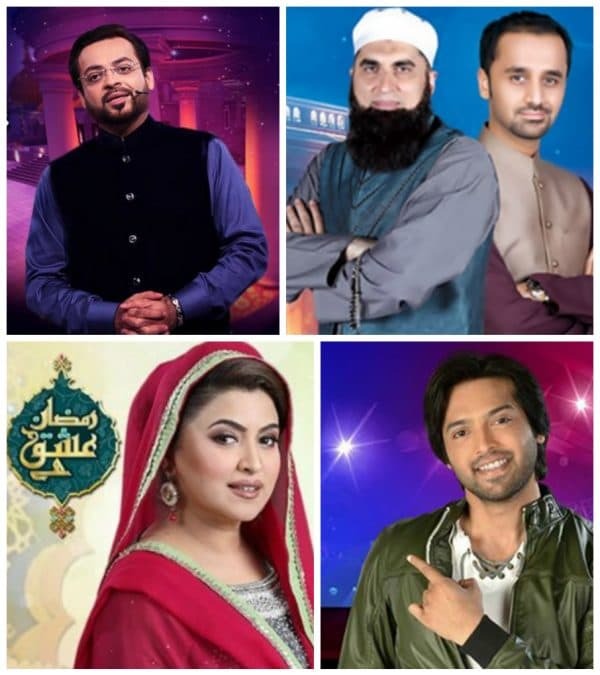 According to the concerned channels and hosts the Ramazan transmission ends with Iftar and after that the hosts are seen using any tactic they can in order to get ratings. Mubashar Lucman was seen bashing Morning Shows few weeks back, now he has shown his anger with the things that are being shown in the name of Ramazan transmission. He condemned in two different shows not only the people who are hosting these shows but also those religious scholars who become part of all such shows. He said that firstly people whose character is unacceptable for many reasons are hosting Ramazan transmissions. He said that these people dance and sing all year and in Ramazan they tell people how to be good Muslims. He also showed some outrageous clips from these Ramazan shows and questioned the Ulemas who chose to stay silent because they too want to be a part of these transmissions so that they can earn money. He stressed that these hosts should stop making a mockery of the holy month of Ramazan. He said that a lot of people were making mistakes but right now everyone was quite. Mubashar Lucman also said that these acts can effect the whole nation in a bad way and this thought was giving him sleepless nights. These shows are undermining the true spirit of Ramazan.